“Your dollar might go further in a Dollarmite Account”. B/ I’d one day get to drive through them. Let me tell you, they’re MUCH cooler than a bunch of hand puppets singing about savings! We have some wild, beautiful scenery in Australia. We have great beaches, wildlife, deserts and the bush, And yes, we have mountain ranges. The Blue Mountains are, well, blue. And Cradle Mountain sure is pretty. But NOTHING compares in size to the Dolomites. Australia’s tallest mountain is (anyone…anyone?) Mt.Kosciusko at 2228 m. Well the tallest in the Dolomites is Marmolada at 3343 m. That’s over a KILOMETRE higher up in the air, and the highest 44 peaks in the range are also taller than Kosciusko. Does that put it into perspective? There were moments driving from Innsbruck to the Veneto that Cam had to pull over just for us to take a breath. It felt like we were surrounded by giants; monoliths that in a moment could crush us. They were so enormous, towering above us, and the pretty ski resort towns that are dotted along the road. 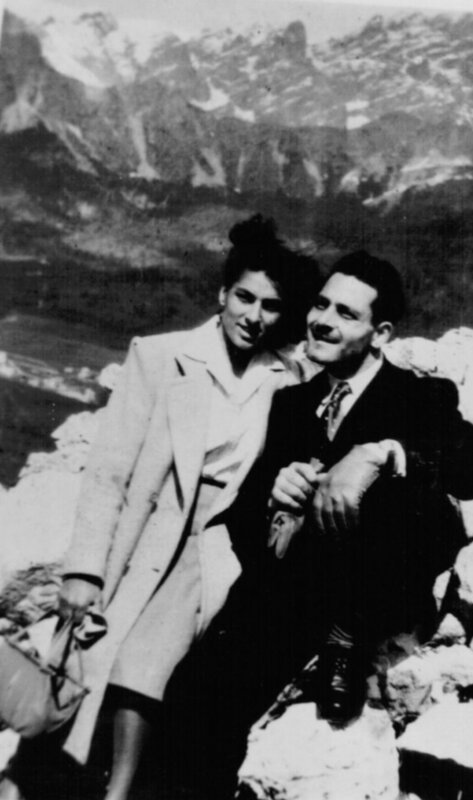 The scenery also brought to memory this photo of my Nonno and Nonna from their courting days in Northern Italy. Nonno was one of the lucky few in town to own a car – a Fiat 500 (or “Topolino” – “little mouse”) that he’d show his gorgeous fiance off in. Here they are on a day trip to the Dolomites back in the mid 40s. And gli italiani are still enjoying their natural playground. The place was awash with families hiking, climbing, pic-nicing, sweating up and speeding down hills on push bikes, and attempting dare-devil maneuvers on motor bikes. Originally we took this route to avoid paying tolls on the Autostrada; but even though it added about 2 hours to our trip, it was well worth every moment.